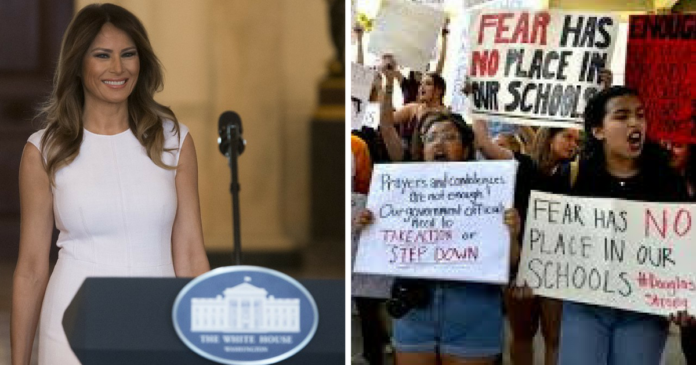 Is Melania Trump Supporting Students Who Want Stricter Gun Control Laws? The media is bound and determined to drive a wedge between the president and his wife, but the unfortunate thing is, she’s not doing much to help the situation. The heinous shooting in Florida has reignited the gun control debate, as the Left has been deploying victims of the incident at rallies and in front of the media to gin up emotion and sympathy. Whether it’s been rumors about Trump’s supposed infidelities or concerning his policy positions, First Lady Melania has mostly remained mum. However, it appears that rather than send ambiguous signals via her clothes or something, Melania’s being a little more straightforward on the issue of gun control. As reported at the Daily Mail, the first lady addressed the Valentine’s Day shooting at the start of her four-minute-long remarks, given to the political spouses of those attending the National Governors Association in Washington, DC. While she didn’t explicitly endorse their views, she expressed admiration for their sudden activism. “In my year as first lady, I have also learned that it’s oftentimes after a tragedy that you see the strength and resilience of the human spirit,” she added. Melania also hit upon the issue of cyberbullying, which is one of the issues she’s promised to tackle during her time as first lady, along with ever-increasing opioid addiction. “My office will be reaching out to many of you in the future as we travel the country and work to promote and fight for the well-being of our children,” the first lady added. Melania’s comments seem quite supportive of the student protesters, albeit in a roundabout way. It will be interesting to see if she becomes more outspoken over her views on the issue or if she’ll continue parsing her words as not to explicitly endorse policies that go against Trump’s agenda.